I first read The Odd Women by George Gissing nearly twenty years ago, when researching my dissertation. I recently decided to pick it up again and have another read, as, although I had really enjoyed it previously, I was reading now just for pleasure. My dissertation was on women in the workplace in the late 1800's, (being a History student, not English literature), in case you were wondering. 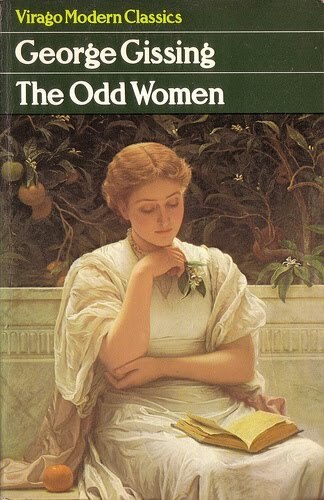 The Odd Women was a perfect book to read, as it tells the story of women trying to find their way in what, at the time, was considered a non-traditional role. The book calls these women odd, not because they are unusual in their life choices, as you might first assume, but rather because they didn't have men to marry. Raised during a time when marriage was seen as the proper course for a young lady, there were simply more women than men. Meaning that a large number of women were 'odd'; they didn't have a partner. The Odd Women looks at a number of different women, who all find themselves having to work for a living. Some who embrace this independence, some who look to the chance of an unhappy marriage, just to save them from the grind of working and some who are crushed by the experience of trying to live and support themselves. In many ways George Gissing's book is ahead of its time, suggesting ideas that would have no doubt seemed shocking at the time. His voice is very passive, though, at no point does he show his own opinion on this, allowing the characters to discuss the options and situation. I do wonder if a woman writing at the time would have been able to express such ideas, I rather suspect that despite the subject under discussion, it wouldn't have been considered suitable for women to discuss and may well have been dismissed as madness or ravings. Although not a particularly uplifting book, it is still well worth a read. Time and attitudes may have moved on much since this was written, but it's still well worth a read. A little different to many of the novels written at a similar time. I'm glad that I picked it up again.